Chennai is the capital of coastal state of Tamil Nadu. 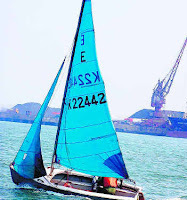 The city, being in the vicinity of the sea, is a paradise for water sport lovers in India. It offers a wide variety in terms of adventure activities, right from parasailing to scuba dining and from fishing to boating. So all the adventure freaks who have not decided about visiting Madras city yet, just pack your bags and head on. Chennai is waiting with its arms open to welcome you and lead you to the exciting and hair-raising territory of sea. Tarsha Water SportsTarsha Water Sports is an ideal place for water sports. It hosts a number of water sports event for the entertainment of the visitors. It provides sports activities that are unique in the whole region and has therefore, become quite popular amongst the natives as well as tourists. The main activities offered here are Water Skiing, Wake Boarding and Knee Boarding. These action-packed activities attract people from all over the state. Kayaking, Speed Boat Rides, Banana Boat Rides, Double Tube Rides and Para-sailing are some other means of amusement provided by the club. Muttukadu Boat HouseMuttukadu is situated at a distance of 36 km from Chennai. The backwaters at Muttukadu are one of the favorite spots for the visitors, as they offer a host of water spots facilities. You can enjoy boating and wind surfing here. It is an attempt by the Tamil Nadu government to lure people towards the Gateway of South, which was formerly known as Madras. Muttukadu Boat House even conducts competitions and training camps for passionate water spot lovers. Wildertrails Adventure ClubWildertrails Adventure Club provides you all the adventure you can want. It organizes treks, camps, jungle rides, cycling treks, etc. It trains youngsters and children for the risks outdoor.